This classic Spring ad reminds me of the Hugo Boss ad I loved so much that just screams fun in the sun. What's not to like? I would imagine the rest of the ads well be just as classic and well put together. Would it be Dolce & Gabbana if it wasn't incredibly dramatic? I saw this add in Harper's Bazaar before I actually saw the whole campaign online and absolutely fell in love. Their poised and incredibly stunning black and white ads never cease to amaze me. It doesn't get much better than Karl Lagerfeld shooting his own creative visions for a campaign. This isn't my favorite ad of the campaign, but it's the only one that showcases both models. Karl has struck gold, once again. It did take me a while to ever realize that Dolce & Gabbana and D&G were like Michael Kors and MICHAEL Michael Kors in terms of the designer's lines. D&G is made for the younger, more carefree generation and I think this campaign screams just that. There were so many amazing ads to choose from that I had an extremely difficult time picking just one. I ended up with this one because it showcased the apparel, the handbags, and the shoes. I can't wait to tear this one out of a magazine and hang it on my wall as decor! The jackets are always what reminds me of a true Burberry campaign and I'm always upset when they don't showcase them enough. I like women's trenches better (for obvious reasons), but I still think Mario Testino (one of my favorites) worked magic with his lens on these two young models. I'm always one for the classic and simple, and I'd have to say this ad is just that. I'm just hoping there is a little bit more diversity throughout the rest of the campaign. But with Karl Lagerfeld as photographer and creative director, I have no doubt in my mind I will fall in love. Easily my least favorite ad for spring, which surprises me because I love Steven Maisel as a photographer. Maybe I expected too much out of them after their amazing Fall 2010 Campaign, but this just isn't doing it for me. Aside from Louis Vuitton's Spring 2011 photos, this is probably the only campaign I genuinely don't like at all. 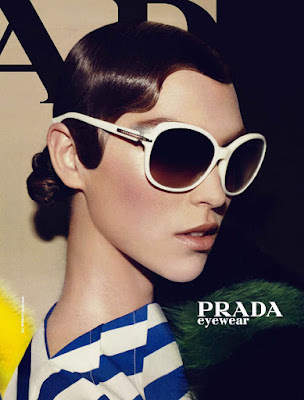 Even though spring fashions are just starting to come out, the Pre-Fall 2011 campaigns are literally emerging as we speak, so expect info on those soon!